The other morning I made Three-way muffins. 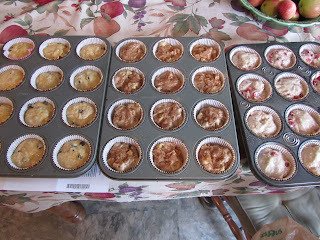 This is my way of making up 3 different varieties of muffins, with one batter. This "recipe" can be easily scaled down to 2 or 1 dozen muffins, and you'll still have the variety you want. I pick 3 flavors, or sets of add-ins. This time I chose pumpkin-chocolate chip, apples and cinnamon, and cranberry-orange. I decide how many muffins I want in total. For every dozen muffins, I use a total of about 1 cup of add-ins. So, as I made 3 dozen muffins, I used a) 2/3 cup of chocolate chips and 1/3 cup of canned pumpkin, b) 1 cup of apple dices plus a teaspoon of cinnamon, and c) 1 cup of chopped cranberries plus about 1 teaspoon of orange zest. 1 cup of add-ins for each dozen muffins. I prepare my add-ins and put each into it's own medium-size bowl (I use round casserole dishes for these bowls). I find a basic muffin recipe, that will make 12 plain muffins. It's the usual 2 cups flour, 1 egg, 1/3 cup sugar, 1 tablespoon baking powder, 1/2 teaspoon salt, 1/3 cup oil, 3/4 to 1 cup milk, and 1 teaspoon vanilla extract -- a basic muffin recipe. In a large mixing bowl, I prepare the batter multiplying out for the number of muffins I want. I very gently incorporate the dry and the wet (it's okay to have some dry ingredients here and there, just not a lot). So, let's say that you just want 1 dozen muffins, but want 2 kinds. (Then they're Two-way muffins.) Choose add-ins for the 2 varieties, and mix up batter for 1 dozen muffins. Divide batter between two add-in bowls, fill muffin tin and bake. I find this to be a great way to use up odds and ends. 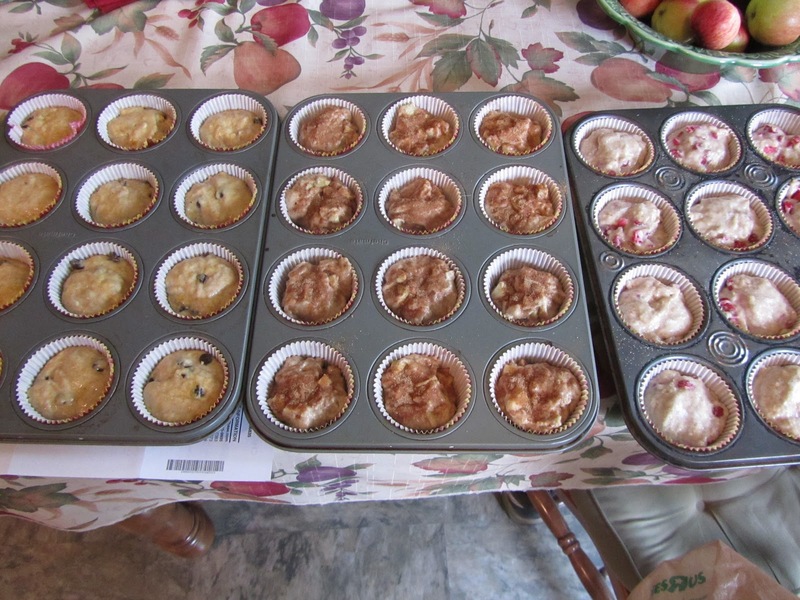 The cranberries and orange zest in the cranberry-orange muffins were leftovers in the freezer, from last winter. The pumpkin, in the pumpkin-chocolate chip, was a smidge leftover from making scones a week ago. And the apples, well, we just have a lot of apples to go through. I later found a small amount of chopped almonds that would have been good in one of the varieties. Oh well, next time. So there you have it, Three-way muffins. In case you're wondering, why the muffin-frenzy? October is soups, stews, and chili month around here. When the cold weather sets in, I like a steaming bowl of something, along with a muffin or dinner roll. I always make a mess with drips when filling muffin papers or cupcakes papers . Do you have special technique to avoid this? Don't know if it will help, but I use an ice cream scoop to fill them. I make less mess than I do with a spoon. I spill quite a bit, too. I have heard of using an ice cream scoop (thanks Shara for the reminder), but haven't tried it yet. I just use a large spoon in one hand and spatula in the other (to catch drips as they fall, sort of). For me, if I place the muffin tin right up against the side of the bowl, I can catch any drips for the row right up against the bowl. Then I turn the tin around so I have the empty spots right up against the bowl. The ones I spill on are the center holes. yum, I love the chocolate chip ones. My two daughters like chocolate batter combined with chocolate chips. My favorite are blueberry muffins. Oh, yes, muffins would be great for a potluck! Not a whole lot of work, and there's usually something in the kitchen that can go in them. Mmm, muffins. So hard to choose. We love pumpkin ... zucchini ... applesauce oatmeal ... peanut butter banana. Here's a fun trick I learned with my peanut butter banana recipe--I don't always do it because it's decadent--anyway, you mix up your batter as you usually would, then at the end add a 1/2 cup of brown sugar. Stir once or twice. DON'T completely combine it. Spoon it into greased muffin tins. The exterior of the muffins will be carmelized. Yum. I give credit for that technique to Jessica Seinfeld in her Deceptively Delicious cookbook. I love the idea of peanut butter banana muffins. They'd have more protein with the peanut butter, and maybe sustain my family longer in the mornings. I'm going to try those soon. Both my daughters are huge peanut butter fans, and I think they might like these as much as chocolate-chocolate chip muffins. Do you have a recipe for the peanut butter muffin recipe you could share? I know I could go online and find one, but I like to try things that I know others have tried and had success. The added brown sugar does sound very decadent. Those would be great for a brunch, I'd think, where the sweet bread sort of substitutes for dessert, as well as a bread. 2) In a large mixing bowl, mix 1/2 cup of the brown sugar with the peanut butter, banana, and the egg. 4) Divide the batter among the muffin cups and bake until the muffins are lightly browned and a toothpick comes out clean when inserted into the center, 15 to 20 minutes. Turn the muffins out onto a rack to cool. 5) Store in an airtight container at room temperature for up to 2 days or freeze up to 1 month. Thanks, Kris! I like that it calls for whole wheat flour. I usually do half white/half wheat, as some recipes taste too wheaty when all wheat. But these, I'll take your word for it that the whole wheat is a plus. These do sound very good!